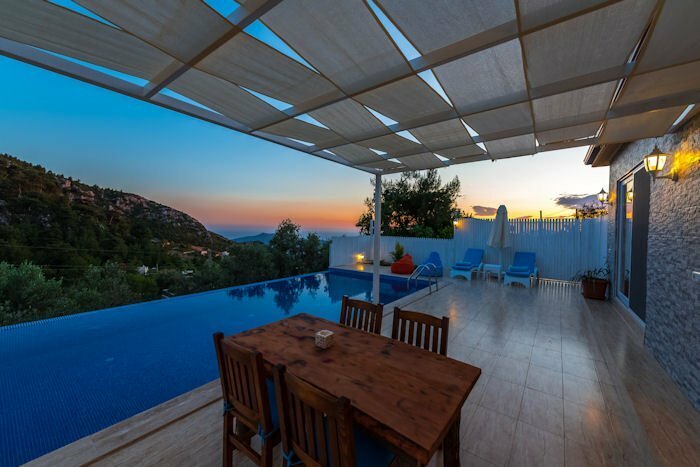 Private hillside villa with stunning views and luxury furnishings with private pool with sea view villa holiday in turkey. Apparently, there are a few things that create the perfect panoramic views, a private pool and complete seclusion and Villa Islamar has all of the above and more. Villa Islamar is an exceptional, luxurious fully air-conditioned, 1 bedroomed, 1 bath and Jacuzzi villa, built in 2016, situated in a unique and serene setting amidst the olive groves and pine trees in the beautiful mountain village of Islamlar. Kalkan Islamlar is renowned for its trout farms; restaurants serving fresh trout, slow-cooked lamb and other local delicacies. Villa Islamar is suitable for honeymoon couple, romantic holiday, luxury villa holiday with secluded pool, infinity pool is not overlooked so its one of the best luxury holiday villa in Turkey. The sea and beach clubs in Kalkan town are approximately a 15 minute drive from the villa. Both Kaputas beach and Patara beach are approximately 25 minutes’ drive from Islamlar. Dalman Airport is 1 hour and 50 minutes by car. Kalkan has a small but pleasant beach only a few minutes walk from Villa Uzum. Or, on the Western side of Kalkan, is Kalamar beach, which has a beach club and a couple of waterside restaurants to choose from.